My daughter-in-law would like a "landscape, country-look" quilt to hang in a stairwall. It needs to be fairly large, like 48" x 60-70" and complicated is okay. Can anyone direct me to an idea or a pattern? I've been looking, and am not having much success. 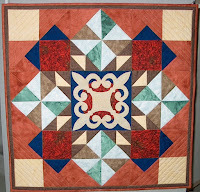 This picture is a quilt that I made using the ideas from Bella Bella Quilts by Norah McMeeking. These designs based on floor tile work always draw my attention. I'd like to try a few more with photos we have taken in various parts of the world. This one was small, but fun to make. I wound up donating it as a door prize and it went to a good home.